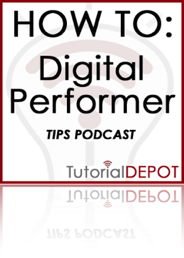 To subscribe to the HOW TO: Digital Performer -TIPS podcast, click one of the links. To view example videos from the HOW TO: Digital Performer-TIPS podcast, click the name of the HOW TO from the list on the right side of the TD-Player below. HOW TO: Digital Performer-TIPs is a FREE HOW TO: podcast providing quick tips for getting more out of your Digital Performer rig. Beginners and advanced users alike will find value in these concise, informative, one of a kind tutorials. For additional and full length tutorials including larger 16x9 screen sizes, added content, special features, and optional mobile phone feeds, check out the HOW TO: Digital Performer-PREMIUM podcasts. Take the HOW TO: Digital Performer-TIPS with you on the road dude! Click link to view a dedicated iPhone ready feed.